The quality of our information is declining with the quality of our presidents. Investigative print journalism is dying. 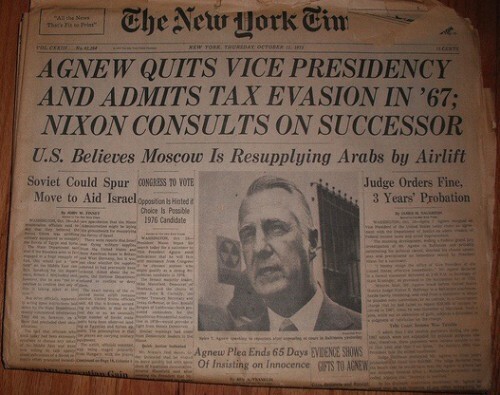 It’s not what it was the last time a Republican moved into the White House without releasing his tax returns. Meanwhile, TV news has been a corporate-run charade for decades. Thanks to neoliberal deregulation of media, six companies control over 90% of the information we consume. But that’s old news. Now, Donald Trump’s hiring of Steve Bannon as Chief Strategist indicates that the White House Brought To You By Cheetos will run a white-supremacist propaganda machine through Brietbart (or however you spell that dead Nazi’s name–I don’t care to Google it). The new information war is already being fought on Twitter. In his first week as president-elect, Trump focused his diplomatic energy on sending angry tweets to the “failed N.Y. Times.” He’s fired off two dozen tweets since election night. Bizarrely, almost a third were directed at the Times–just for reporting facts about his incompetent transition. Trump’s attack on the Times may seem like another goofy quirk of his sociopathic personality, but the strategy is clear in the scheme of information control. With print approaching zombie status, TV news neutered, and a new Goebbels controlling government information, the Times’ reporting is almost all that remains of mainstream American journalism to keep the new regime’s pathological lying in check. In 2014, the Times was one of only three daily newspapers with circulation over a million: the others being the Wall Street Journal (owned by Trump-friendly Rupert Murdoch of Fox News) and USA Today (which is basically corporate TV news on paper). Once the Times falls in line or gets sufficiently discredited, where else do well-meaning Americans turn for information to hold their government accountable? Howard Stern? Conspiracy theorist Alex Jones (who was one person Trump actually took the time to thank after the election)? You might think Anderson Cooper will save you. Listen closely: Anderson Cooper isn’t going to save you. The corporate media conglomerates will play nice with Trump, normalize him, and lionize him. They’ll embarrass themselves and humanity at large with lukewarm “criticisms” of the new regime in between Viagra commercials. For the next four (or God forbid eight) years, they’ll continue to generate Jimmy-Fallon-hair-rubbing PR fluff that pacifies the masses. Not because they’re afraid of Trump’s tweetstorms, but because they are owned by the same business interests whose unlimited influence on politics created America’s soon-to-be-fascist state in the first place. Trump got elected on fake news made viral by uncritical Facebookers and aggressive Russian intervention in the election. With the help of Putin and other far-right forces coming to power, he is leading us into a post-fact world, designed by “the 1%” to convince the working population to act against its own interests. Eliminate the social security and Medicare you’ve paid into your whole life while signing off on irresponsible tax cuts for the super-rich. Cheer your billionaire presidential candidate for not paying taxes he owes you–but be sure to pay your own taxes on time! Mock every scientific organization’s warnings about global warming–while forgiving climate-change-causing pollution by the energy companies who own your representatives. Give blank checks to the military-industrial complex to fight scary brown people in faraway lands because two people with foreign names shot up a dozen people in California and called it Islam. Don’t spend public money on reducing the cost of your society’s health care or education. Let the free market determine your prescription costs and tuition fees. The same “free market” that has already caused your health care and education costs to bankrupt you. Build a huge wall. A wall at the bottom of Texas will solve all your financial and social problems in Flint, Michigan. It’s more important than having clean water to drink. After all, water is not a human right. Despite the fact that you have no interest in throwing out used condoms in a Motel 6, it’s the hard-working Mexicans that will cost you a job, not the millions of machines that threaten to eliminate nearly half the U.S. workforce. Focus your outrage on immigrants, not the filthy rich people who pay less tax than you. I’d never tell you how to spend your money, but it might be a good time to subscribe to the New York Times. Or any news outlet that holds those in power accountable. Posted in Social Justice Blog and tagged Bernie Sanders, New York Times, Trump Train, twitter. Bookmark the permalink. Trackbacks are closed, but you can post a comment.